NASA's Mars Reconnaissance Orbiter took this image of the larger of Mars' two moons, Phobos, from a distance of about 6,800 kilometers (about 4,200 miles). NASA's ever-growing footprint at Mars may extend out to one of the Red Planet's moons a decade or so from now. Scientists and engineers at NASA's Ames Research Center in Moffett Field, Calif., are drawing up a low-cost mission concept that would send a robotic spacecraft to one of Mars' two tiny satellites, Phobos and Deimos. "We think we can do 'LADEE 2' for a few hundred million [dollars] and go to Phobos," Ames director Pete Worden said during a presentation in February at the NASA Innovative Advanced Concepts symposium at Stanford University. The original LADEE relies not on custom-crafted, mission-specific infrastructure but rather an Ames-developed "modular common spacecraft bus" that can be adapted for a variety of uses and destinations. The modular approach would help keep the potential LADEE 2's costs down, Worden said. "We've got some spare hardware hanging around here that we could make it even lower-cost," he said during a NASA budget news briefing on March 4. LADEE 2 could launch sometime after NASA's bold asteroid-capture mission, Worden added. The space agency is still mapping out the details of its asteroid-redirect effort — which aims to drag a near-Earth space rock into a stable lunar orbit for future visitation by astronauts — but current projections call for lofting the capture probe around 2019, with the asteroid arriving in lunar orbit in 2024 or 2025. There is no money for LADEE 2 in the NASA budget, Worden stressed, so it remains a concept mission for now. "This is one we're very excited about," he said. "We'd like to see it be a planned mission, but we have some work to do first." 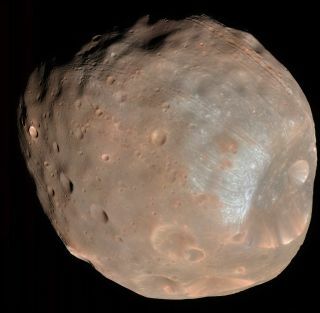 Most scientists think Phobos and Deimos are former asteroids that were captured by Mars' gravity. Phobos is 14 miles (22 kilometers) wide on average, while Deimos has a diameter of just 7.7 miles (12.4 km). (For comparison, Earth's moon is 2,160 miles, or 3,475 km, wide). A robotic mission to Phobos or Deimos could help pave the way for an eventual manned trip to one of these moons. The prospect of a human "base camp" on Phobos or Deimos is enticing to many researchers, who envision teleoperating rovers on the Martian surface and studying samples launched from the Red Planet up into orbit. (Phobos orbits a mere 3,700 miles, or 6,000 km, from Mars; Deimos circles at an average distance of 12,470 miles, or 20,070 km). NASA officials have said repeatedly that putting boots on Mars is the long-term goal of the agency's human spaceflight program. But they are considering manned missions to Phobos or Deimos as a potential precursor, and possibly as a way to get astronauts to the vicinity of the Red Planet by the mid-2030s — a goal laid out by President Barack Obama in 2010. NASA already has two functioning rovers on the Martian surface — Opportunity and Curiosity — and two operating orbiters, Mars Odyssey and the Mars Reconnaissance Orbiter. Another orbiter, called MAVEN, launched in November and is scheduled to arrive in September. The agency also plans to launch a lander called InSight toward the Red Planet in 2016 and a sample-caching, Curiosity-like rover in 2020.